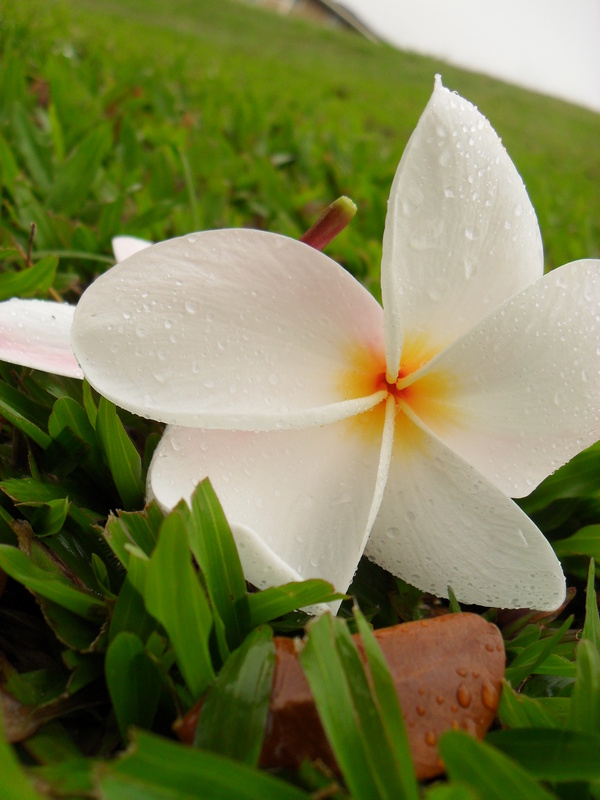 Dew drops cling to Plumeria blossoms, lining grasses like little bits of forgotten confetti on the 2nd of May, as the air is warmed with the sweet titillating fragrance of Plumeria. It dances across the wind like thick tendrils of smoke emanating from a burning stick of incense swept up by the currents of a room. Spring has arrived in Hawaii! My living in a tropical climate has taught me that it takes a little better tuned senses to realize the arrival of a new season. It’s not quite as easy as it used to be back before I found myself on this heat infused island. The first day of spring was always the first day you could go outside without a sweater, the first day you could feel the sun as it warms your skin and intoxicates your very soul with each heat soaked ray. When everything begins to turn green and once again the meadows and forests were alive with the movement of all the little creatures that had been hiding from the cold icy hands of the post autumn freeze. The first sign of Hawaiian spring was the fledglings, little half feathered baby birds on their first trips out into the world and away from the nest. We were lucky enough to be graced with two little overnight guests roosted on a rock in our back yard after being fed and tucked in for the night by their mother and father, they were left to dream little bird dreams until the morning came and they were called away to hop about the fields in search of mangoes, and early worms. The second sign of Hawaiian Spring was the flowers. Now don’t get me wrong there are always tons of flowers all year long, but this… this is ridiculous! It’s as if every tree on island has exploded into rainbow colored fireworks covering every branch with blossoms and sprinkling the ground with little fragrant bits of shrapnel. My time in Hawaii is winding down, less than five months until I’m given the option to choose (my) Humboldt for good. I do miss my home. The place I came from, and all the people (and animals) that make up my family, the cold Gray beaches framed by towering redwoods, the community based cultures and the flower based subcultures, sweltering dry summer days spend splashing in the cool waters of the Eel river, seeing my best friend a hand full of times in a week, the fresh mountain air, and the unforgettable undeniable sense of knowing that this is the place you belong, but all of that aside. I will miss Hawaii, if for nothing else than for the sweet smell of plumeria carried across the island on the arms of the Trade Winds.